The American media and political establishment are in the middle of a five-day exercise in moral hypocrisy, cant and myth-making surrounding the death of Republican Senator John McCain. The operation involves nearly every news channel, newspaper publication and politician, Democrat and Republican, following a common script in preparation ever since McCain was diagnosed with brain cancer more than a year ago—John McCain, the “American hero,” the “warrior,” the “maverick,” the likes of which the world may never see again. 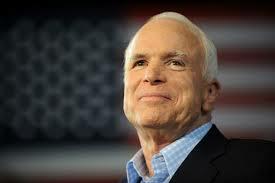 On Thursday, a ceremony was held in Arizona featuring speeches by former Vice President Joe Biden and others, concluding with the playing of Frank Sinatra’s, “My Way.” From there, McCain’s body was flown by military aircraft to Washington, where it lay in state in the rotunda of the Capitol building yesterday, a distinction accorded to only 30 other people. McCain’s casket was placed on the wooden catafalque originally built for President Abraham Lincoln after his assassination in 1865—only one of the many political obscenities associated with the affair. The main memorial service is being held in Washington today, featuring eulogies from former presidents Barack Obama and George W. Bush, former Secretary of State and war criminal Henry Kissinger and others, before McCain’s body is interred in the ground near the Naval Academy in Annapolis, Maryland, on Sunday. Among the pall-bearers in the final scene of the play is actor Warren Beatty, a Democratic supporter and friend of McCain, who will be joined by Biden, ex-Defense Secretary William Cohen, and anti-Putin Russian dissident Vladimir Kara-Murza. Biden’s speech on Thursday set the tone for what has followed. “My name is Joe Biden,” he began, “I’m a Democrat. And I loved John McCain.” He regarded McCain as “a brother,” Biden said, and while they had “a lot of family fights,” these differences were overshadowed by what they had in common. Biden, vice president for Obama, who defeated McCain in the 2008 elections, was echoing the comments of Obama himself on the 2016 elections—an “intramural scrimmage” between two sides on the same team. What can one say about such absurdities? The American government and its military are despised the world over, responsible for inflicting death and destruction in countless countries—Afghanistan, Iraq, Libya, Syria, Yemen, Palestine and many more. This “so decent” government declares the right to kill anyone, invade any country, overthrow any government that gets in its way. The modus operandi of this “so fair” ruling class is that of bullying, threats and violence. It is with the unbridled use of military force that McCain is most closely associated. He was among the most vociferous and earliest backers of the 2003 Iraq war, the Obama administration’s war against Libya and the CIA-backed operation in Syria. In support of the latter, he infamously traveled to Syria and met with the Islamic fundamentalist organizations spearheading the civil war. He was a strident advocate of aggression against Iran and an adamant opponent of any restriction on the gargantuan US military budget. The coordinated and choreographed response to McCain’s death is determined by definite political considerations. There is, first, the factional conflict within the ruling class, pitting dominant sections of the military-intelligence apparatus against the Trump administration. McCain has played a central role, in alliance with the Democratic Party, in the anti-Russia campaign, aimed at enforcing a more aggressive foreign policy in Syria and against Russia itself. In the media, much has been made of McCain’s detailed instructions for his final sendoff from this world, which he reportedly worked on for months, including the demand that Trump not participate. The Democrats—from Biden and Obama to “left” representatives like Bernie Sanders and Alexandria Ocasio-Cortez—have seized the opportunity to associate themselves with a figure who throughout his life maintained the closest ties to the military. Always eager to declare their fidelity to this apparatus of violence, the Democrats have elevated McCain, along with former CIA Director John Brennan, into their political pantheon, the better to conduct their opposition to Trump on the most right-wing basis possible. The effort to develop a new political psychology to justify permanent and unending war requires a falsification of history. In all the hosannas to McCain’s “heroism” in Vietnam, there is not an ounce of critical comment on the character of the war, a barbaric imperialist intervention that killed three million Vietnamese and nearly 60,000 American soldiers. In the ten years between 1961 and 1971, the US military carried out countless atrocities and dumped more than 20 million gallons of toxic chemicals in Indochina, turning a third of Vietnam into a wasteland. McCain himself was more honest about the nature of the war when he reflected on the experience in 2001. The first quote cited above is from a comment written in April of that year defending former Senator Bob Kerrey after the latter admitted to participating in a death squad attack on the tiny Mekong Delta hamlet of Thanh Phong, in which he and six soldiers under his command killed 21 women, children and elderly men. The effort to end the “Vietnam Syndrome” has entailed not only the falsification of history, but the elevation of the place of the military in the political life of the country. The deification of McCain, the military-state man, the “hero warrior,” is part of this. Until the 1990s, soldiers were not referred to as “warriors.” Most veterans of World War I and II, not to mention Korea, did not want to talk about their war experiences, and certainly did not want to put on a military uniform. Today, the military, along with the intelligence agencies, exercises an ever more dominant role over all American life. The military is embedded in the media, and the media is embedded in it. Politicians, Democrats as much if not more than Republicans, cite their military and intelligence backgrounds as their most important qualifications for office. The universal glorification of the military expresses the hollowing out of American bourgeois democracy under the impact of unsustainable levels of social inequality, a political radicalization among workers and youth, and a deep and abiding fear on the part of the ruling class that its project of imperialist conquest and social counter-revolution will encounter mass resistance. One final point on the canonization of John McCain. Perhaps the defining feature of the whole operation is its hollowness, its artificial character, its disconnect from the concerns and thoughts of the vast majority of the population. No matter how hard they try to elevate McCain into a political and moral giant, most people don’t give a damn about his death. McCain is as dead as a doornail, and he will rapidly fade from popular consciousness. The first anniversary of his death, and all those that follow, will pass unnoticed.